Vendor Managed Inventory (VMI) can be an effective strategy for companies looking for cost savings and a more stable supply chain. In this post, we will outline the benefits of VMI as well as the services that CGR Products provides with these programs. VMI is a program where the supplier manages your inventory for you. These programs helped make some of the largest retailers the giants they are today. After seeing these successes, manufacturing caught on as a way to move toward lean practices and to become a demand-driven supply chain. With traditional purchasing and stocking methods, sales are predicted and inventory is ordered based on the forecast. This method comes with risks of buying too much or too little. In the event of too little inventory, a risk may be present if the supplier cannot meet the higher than expected demand and lost sales may occur. Too much inventory will tie up money and can cause warehousing (cashflow) issues. With VMI, the goal is for the customer to only buy what they are moving. Using VMI requires a very close relationship between the customer and the supplier. Using technology to maintain constant contact between both parties, the customer can purchase in smaller batches and avoid emergency orders. Using this data allows both parties to work off of much more accurate forecasts. CGR Products has been providing VMI services to our customers for many years. Based on great relationships and communications with our customers, we keep properly maintained inventories based on actual usages and forecasts. Our VMI programs give us more control so we can manage raw materials and be more efficient. CGR Products can offer many different configurations of VMI. Working with our customers to find the VMI system that works best for them is the key. Bins are set up at the customers’ location where they are physically needed. The driver counts the inventory on hand. Determines the appropriate re-order quantity based on recent usage and predetermined stocking levels. Enters the quantity consumed and the quantity to be re-ordered. Electronically scans the provided barcode label on each bin to assure accurate capturing of the item details. Orders are electronically transmitted directly into CGR’s manufacturing system via our proprietary inventory technology. On the next visit, stock is rotated, new stock is scanned into inventory, and the bins are refilled to the acceptable level. VMI runs on a revolving weekly schedule, with deliveries occurring once per week or multiple times per week depending on customer requirements. Other Programs CGR Products currently works with include EDI and Portals. CGR Products works directly within customer portals to maintain inventory and execute orders. Orders are electronically placed directly into our manufacturing system from the portal. These types of systems allow for more accurate order fulfillment with fewer errors and often include electronic shipping notices, invoicing, and payments. Ensuring the necessary parts are ready and available when needed. Smaller orders allowing for lower inventory costs. Close communications and partnerships between customers and suppliers. To learn more about how CGR Products can help with your critical inventory management, please read our article on how OEM’s can optimizing their supply chain. Ready to get started, Contact Us today or look into taking advantage of our OEM Partner Program. Water jet cutting, kiss cutting, custom die work — it was all on display at our Wisconsin Open House this past October. Our team was on-hand to help guests get acquainted with some of these state of the art machines, and took the opportunity to chat about some of our most successful recent projects. See for yourself by viewing the videos below about some of the projects we’ve worked on, shot live at the open house. Seeking continuous improvement can sometimes present serious challenges — especially when it comes to equipment. For this automotive customer, CGR assembled a diverse team for a tightly organized Kaizen meeting to help evaluate the existing process step-by-step. As a result, we were able to develop five new, carefully controlled systems to fit the existing machinery that cut costs and enhanced production rates by 33%! Working with specific requirements and tight tolerances can be a challenge for many companies. For this client, the product was being crafted with an acid-etched die. Our Account Manager and Quality Manager reached out to fine-tune the tolerance standards for this customer, and the team also updated equipment in order to streamline production. In a recent project with a large automotive customer, CGR was asked to reduce costs while ensure production would not be delayed. CGR formed a Kaizen team to evaluate their current manufacturing process and developed several cost-saving ideas regarding tooling. With some re-engineering of existing configurations and proactive cost evaluation, we were able to cut annual raw material costs by $26,000. Repair costs in the field are expensive, stressful, and dangerous. One OEM’s gaskets were failing, so CGR found a superior material choice and design. By incorporating a laminated gasket with a metal core and bonded rubber compound, the team enhanced critical sealing performance and reduced costs in the process. Difficult installation processes are one of the greatest gasket challenges, especially for large engines and power generators. For this OEM, our product development team designed a multi-layer gasket for essential sealing performance with ease of installation in mind. The design has become one of today’s industry standards. New EPA regulations meant that a hose manufacturer had to alter its assembly construction, and the changes came with a variety of challenges. From increased production costs to new leaking issues, their technicians were faced with a struggle. We worked with new materials, new equipment, and an automation assembly machine to get the job done. With over 100 pieces of professional equipment and a long list of success stories, the CGR Team is ready to tackle any gasket challenge. See more of our work on the Case Studies page, or reach out to the team today to learn more. While generally overlooked during production, packaging solutions have a significant impact on your project’s overall costs. For OEMs requiring custom fabricated rubber, foam, and plastic products — such as gaskets, seals and tapes — there are a number of packaging solutions to not only reduce costs, but also protect the product during shipping. After cutting and fabricating these products for over 50 years, CGR Products put together an infographic that lists some of the common packaging problems we’ve seen customers encounter, followed by the solutions we offer to combat each of the issues. Check out the infographic below to find the solution to your issue. Now that you know how to fix your packaging issues, take the next step to reducing product costs with an optimized supply chain. Our guide, How OEMs Can Optimize Their Supply Chain, offers six research-backed solutions to get you there, including how to manage your inventory properly and tips for selecting the most cost-effective supplier. Download your free copy of the eBook here. Which Gasket Materials Are OEMs Using in Your Industry? Posted by Chuck Keeley on July 14, 2016 8:46 am | Comments Off on Which Gasket Materials Are OEMs Using in Your Industry? Construction applications and marine applications are both regularly exposed to extreme environments — from dust and chemicals to humidity and fluctuating temperatures. With conditions like this, specialty materials are required. CGR routinely works with OEMs whose products undergo these conditions, during which we’ll partner with industry-leading suppliers to make sure their materials and our manufacturing processes get the job done. Two of our suppliers recently highlighted these OEM projects on their websites, published as success stories for gasket and seal components. Armacell, a world leader in the manufacturing of flexible insulation foams, focused on our project for an OEM construction application that involved the fabrication of Ensolite foam. Rogers Corporation, a specialty materials manufacturer for cushioning, sealing, impact protection, or energy management applications, described CGR’s manufacturing processes of PORON® for a display mount cushion to be installed in a marine vessel. As a stand-alone material, Armacell’s Ensolite foam is known for its exceptional sealing capabilities and high-performance physical structure. However, for this particular construction application, an OEM needed a wide range of seals in a variety of thicknesses to meet their product criteria — some even thicker than the raw material itself. Problem: The company needed seals that offered quantifiable noise reduction, as well as compliance with several stringent global specifications. In some cases, the seals needed to be up to 90mm thick and able to withstand trials, testing, and fit requirements for over 100 unique applications. Solution: First, the team assessed the material and determined that the appropriate thickness could be attained by laminating the foam material prior to custom cutting. After selecting and testing a suitable adhesive and developing an effective laminating process, the rolls of foam were further laminated with a PSA (Pressure-Sensitive Adhesive) for attachment to the OEM’s substrates. Finally, with our custom waterjet and die cutting equipment, the components were cut to precise specifications and quantities. They are now custom packaged, coded, and shipped every week. As a preferred converter at Rogers, CGR’s team was familiar with Rogers’ PORON Polyurethane Foams. This marine industry OEM needed more than just water or fluid resistance though — their gasketing and cushioning system needed to withstand weather vibrations, physical shocks, dramatic temperature fluctuations, and more — all to protect an industrial-duty touch screen display. Problem: Touch screens are not normally required to endure the harshness of the proposed industrial marine environment: humidity, wetness, shock, and extreme temperatures were just the beginning. The OEM placed a premium on the protection of this sensitive equipment. Solution: In addition to selecting an exceptionally high durability material, the CGR team developed a unique system of parts with two levels of protection to support the screen. The completed assembly required four different gasket components, all designed from scratch and crafted with the use of our skiving, laminating, slitting, and die cutting equipment — and all developed and prototyped within three weeks. Annually, we now deliver thousands of these assemblies. With over 100 pieces of professional equipment and a nearly unlimited range of Material Suppliers to choose from, CGR regularly produces gaskets and seals for construction equipment parts, marine applications, and so much more. Visit our Case Studies page to learn more about the industries and materials we’ve worked with and to see specialty examples of CGR at work. Die Cutting vs. Waterjet Cutting: Which One Should You Use for Your Project? Posted by Mike Burris on February 3, 2016 9:00 am | Comments Off on Die Cutting vs. Waterjet Cutting: Which One Should You Use for Your Project? More cutting methods are available today than ever before. While friction sawing used to be the primary industrial material cutting option, there are now nearly a dozen viable choices. Not all cutting methods are created equal — which isn’t to say that one is categorically better than another, but rather that they all have their own strengths. To ensure the accuracy, efficiency, and cost effectiveness of your next project, each designated cutting method specified for a particular part should be a major consideration starting in the design phase. Two of the more common cutting methods that manufacturers offer today, die cutting and waterjet cutting, each have benefits that are suited to particular needs. Waterjet cutting, exactly as its name implies, uses highly pressurized jets of water to cut through soft materials. When harder materials such as metals or plastics are needed, abrasive mineral can be added to the water to enable the waterjet to cut these materials as well. This method offers several benefits over die cutting and other cutting methods. Primary among these benefits are the clean cuts that the process generates. Many companies consider waterjet cuts to be “finish cuts,” aesthetically acceptable cuts that require no secondary finishing processes. This is important for applications where financial budgets or time constraints are a concern — finishing processes add both time and money to your project. Waterjet cutters are able to maintain tighter tolerances in their cuts because the cutters are controlled by highly accurate computer software. Additionally, the process creates no mechanical stresses in the material being cut, eliminating the loss of tolerance caused by warping. Most die cutting processes, including rotary die cutting and progressive die stamping, are continuous processes. In these processes, rolls of material are continually fed into the equipment and stamped parts are continually output. Simple parts in particular can be produced at great rates. Simple flat cogs, as an example, can be completed in one second with a single stamp. More complicated parts can be quickly manufactured by utilizing a progressive die stamping process. Particularly important for large volumes of identical components, die cutting creates parts with a high degree of uniformity. Punching a part out with one swift movement prevents variances that can occur in processes that cut a shape around the edges. Tool and die fatigue can occur, but a quality stamper will know his machines and replace affected equipment long before they can impact the quality of the parts. Because of its ability to create very high volumes of parts with a high degree of uniformity, die cutting is a relatively inexpensive method of cutting. The high output reduces time and, therefore, labor costs, and uniform products reduce losses related to quality assurance. Additionally, die cutting equipment is fairly standard — many companies perform die cutting, so competition keeps costs reasonable. Tool and die manufacturing can be costly, but high volume part orders can easily negate that one-time expense. Over the course of more than 50 years, CGR Products has developed expertise with a range of different cutting methods — not only die and waterjet cutting, but also knife cuttingand more. Not every method is the same, nor are they all suitable for any project. 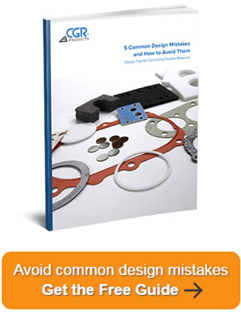 To learn more about cutting methods and other important design considerations, download our eBook, 5 Common Design Mistakes & How to Avoid Them. Knife cutting is one of the fastest and most precise methods for producing parts. From prototypes to final products, no matter the shape or size of a design, knife cutting technology offers flawless production for a wide range of materials. We’re excited to feature brand new technology to the CGR Fleet from ATOM. “Cutting”-edge tooling, increased versatility, and unrivaled precision are just the beginning. The Flashcut FLEX HD S Series, part of ATOM’s family of Dieless Knife Cutting Tables, delivers the ideal cutting surface for CGR’s range of flexible materials. The table’s static working surface is supported by a powerful 11kW vacuum pump to hold material in place, eliminating potential errors from movement and the need for sacrificial sealing. Automatic nesting with integrated software helps nest shapes within shapes, producing better yield and reducing waste and cost for everyone. The reduction of dies and tooling offers a cost savings advantage. Part concavity is virtually eliminated as well. The Flashcut offers an advantage over waterjet cutting as the dieless knife process does not have any issues with water/moisture contamination. Less hand cutting and fewer steps are needed for every part. Check out all of our available custom cutting services, from knife cutting to water jets, laminating services, and more. Getting the proper lamination for your products can mean the difference between a good, sturdy product that is protected or one that doesn’t measure up. When you need the right lamination for your item, CGR offers the right products to fit your needs. With lamination available for products that range in size from 0.062” to 3” thick and at widths up to 84” wide, there’s something for every application. At CGR we offer a variety of lamination techniques using different methods to ensure you get the proper lamination for your project each time. At CGR we have a wide range of lamination procedures including pressure sensitive adhesive products, chemical fastening systems, and even thermal, film barrier and polyethylene glue web lamination. Depending on what needs to be laminated we also offer foam tapes, PSA, sticky back adhesives, tape laminate, peel and stick and more. The variety of adhesive options offered range from economical to high performance when permanent bonding applications are required. If you have flexible materials that are dissimilar, we can bond them together with specialty composite laminations. CGR has serviced a wide range of industries including: automotive, heavy equipment, mining, appliances, marine, medical equipment, military, and more. CGR has lab facilities for engineering and quality reports, to ensure all of our lamination services are consistently meeting standards. With two warehouses full of stock, we are able to offer short lead times for repeat items and new services. If you have something that is soft and pliable, CGR can help you with your laminating needs. At CGR Products, we offer value-added services to enhance your company and its products. Our aim is to use our top-quality services to meet your organizational needs and go beyond what you expect of us. Our CGR team offers an array of value-added services for the design, packaging, assembly, repair and distribution of your goods. Let us take weight off of your shoulders and also help you craft the product you envision for your customers. Our developers, for example, offer design assistance, whether for parts or engineering. We also provide quality assembly kits and products, part stocking programs, and material or product certifications. Our value-added services cover a wide range of packaging solutions. Popular services that we provide include marking individual parts for identification purposes and printing logos onto products. Perhaps our inventory management services are what you require instead to streamline your business operations. Additional services for you are bar code labeling, vulcanizing, slitting and stripping. When you want repair kits, we have many types to offer you, including custom tube cutting per customer specifications and special quantity bagging. For customized distribution of finished goods, we can handle that activity for you too, regardless of your business size. We customize our services to your business, recognizing each industry that we service has unique processes, designs and regulations. Our customers span several industries, from automotive, lighting, and generators to RV, appliances, HVAC, power tools and so many more. We follow industry standards and our team has in-depth technical knowledge and expertise. From the development to packaging and distribution phases, CGR is here to help you. Posted by CGR Products on May 27, 2014 8:55 am | Comments Off on What is EMI-RFI shielding? To understand what EMI/RFI shielding is, we must first understand what EMI/RFI is. EMI stands for electromagnetic interference and when dealing with radio frequency, it is addressed as radio-frequency interference. These interferences can cause a disturbance with electronic devices. In turn, these disturbances can degrade and limit the effectiveness of a circuit within the device. Broadband – This originates from the unintended radiation from sources like power lines. With both narrowband and broadband interferences, industries must find ways to protect their equipment. In order to do this, EMI/RFI shielding agents must be used. These agents are normally acrylic based sprays but can also be paints or brush-on coatings and are applied to electronic housings. These shields contain extremely pure metals such as copper, silver and nickel, to help eliminate the EMI/RFI interference. While it is important to protect your electronic devices from EMI/RFI using sprays, paints and coatings; it is equally important to make sure that your equipment isn’t doing any of the interfering. Modern electronic equipment may need EMI gaskets to help avoid the radiation of frequency waves interfering with other electronic sources. Because we are in an increasingly electronic age, the need to protect electronic from causing interference is very important. That is where we come in. We offer EMI shielding gaskets, conductive tapes, shielded windows and more. Our products are suitable for a diverse set of markets, such as military, aerospace, medical, fluid sealing, environmental and microwave applications. For more information and for the products we offer please call us at (877) 313-6785 or visit our website. Now that you better understand Kiss Cutting, it’s also important to understand when Waterjet Cutting benefit your manufacturing process. Perhaps the most important characteristic of waterjet cutting is that it can be used on materials that are sensitive to high temperatures that are common of other methods. Essentially,Waterjet Cutting is the use of a high pressure stream of water to shape or cut a material. The process can be dated as far back as the 1930s when high pressure erosion devices evolved into industrial cutting machines. Although they could only cut softer materials such as paper in the beginning, the technology developed methods of increasing water pressure which now give us the ability to cut materials as tough as stainless steel and at extremely high speeds. At CGR, we find that Waterjet Cutting is the ideal choice for samples, prototypes, and quick-turn jobs because of its ability to offer excellent material yield. Utilizing a CAD operating system, our waterjet equipment has a rapid changeover time and allows for quick and easy dimensional changes to your parts. We are also capable of producing 76” wide cuts with an unlimited roll length. The CAD system that we use allows for maximum yield gains when compared with standard press die cutting. Add in the four head design of our waterjet fabricator and you’ll see why we are able to make multiple cuts with a faster production time. Using our waterjet fabricator services also lowers your initial set-up charge because the machine requires no tooling or tool maintenance, which means no cost is passed on to you and your business. Next time you need a prototype or a quick turnaround, consider Waterjet Cutting; it’s environmentally friendly and exceptionally effective.